Pipeline Operators Underusing Potential Pipeline Rehabilitation. By selling recovered line pipe into the structural market instead of rehabilitating it for its own use, the pipeline industry is underusing a potentially valuable asset. The cost of new 8.625-in. OD steel pipe runs as high as $25/ft. The same size and grade can be excavated for less than one-third the cost. This article examines the factors affecting potential recovery and rehabilitation of retired line pipe. An 8.625-in OD pipeline was laid in 1920 near Tulsa to transport crude oil from a new field to a tank farm 40 miles away. The field depleted within a few years, but in the late 1920s, the pipeline was recovered from Oklahoma and transported to the Permian basin in Texas to transport new crude oil to a tank farm. Originally, pipelayers spread the line out in 20-ft sections kicked off of wagons pulled by teams of mules into a man-made ditch. Five-ft chain tongs and 48-in. pipe wrenches sufficiently tightened joints, individually screwed together at 20-ft intervals, to hold back up. 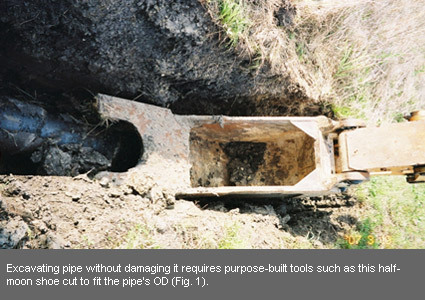 This practice led to a pipe collar visible on the outside of the pipe showing a connection every 20 ft. The pipe often disconnected during attempts to recover it from the ditch in Oklahoma. Oxyacetylene welds were strong enough by the late 1920s to keep the needed pressure on the pipeline for low-pressure crude transportation, though they were not as strong as the pipe wall. Such weld strength eliminated the need for two or three men with large pipe wrenches and chain tongs. Removal of the old collars and threads and beveling the surfaces facilitated the new oxyacetylene-weld jointing technique when the pipeline moved in 1928 from Oklahoma to Crane, Ward, and Winkler counties in Texas. This pipeline went through three owners over time and was purchased for salvage in 2007. The fields and wells the pipe was intended to service had been depleted, and it was no longer viable as a pipeline where it was. A pipeline-recovery team removed the line and the operating company's marketing department found, despite a little wear, the pipeline retained the qualities of good Grade B steel. WT was intact and had little corrosion, making it suitable for transport of slurry from a copper mine in northern Mexico to the disposal site nearby. The owner plans to use it for as long as the mine is in operation. An additional 30-mile section was shipped to Vietnam as a water transportation pipeline near what is now Ho Chi Minh City. It will probably be in use there for another 40 years. Pipeline Equities in 2008 took up a 6.625-in. OD line in Central Louisiana in gas service for 9 years. The field was depleted and the landowner, using the land for timber, wanted the pipeline removed so he could use the right of way to plant more trees. 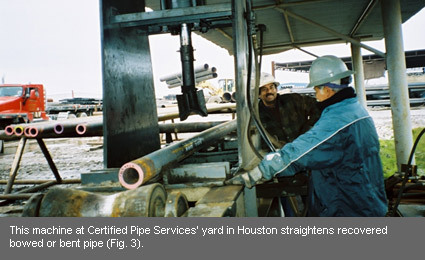 PE took up the line and transported it to Certified Pipe Service Inc.'s Houston yard where workers cleaned out paraffin from the interior, straightened the joints where needed, and removed the fusion-bonded epoxy coating from their exteriors. PE then beveled the ends and sent the pipe to a recoating yard. It is now in service as a gas transmission line in Oklahoma, saving the customers 30% off the cost of new pipe. An 8.625-in. OD pipeline relaid in the 1950s near Amarillo, Tex., used one of the first electric-weld constructions. In service until 5 years ago, the pipe's coating remained well bonded and the pipe itself in excellent condition. A customer wants the pipe taken up with minimal or no damage to the coating. PE estimates 15% damage to coating, an amount economically replaceable in the field with patches, taking up the pipe in 60-ft sections to decrease the number of welds and limit trucking expenses. The customer plans to relay the line for low-pressure natural gas service in the Permian basin. Another Texas gas producer and pipeline company has a policy in place to purchase idled or abandoned lines for takeup and removal to its own system. On four occasions in the past 3 years, the company has excavated, 8, 6, and 12-in. OD line pipe from dormant systems, rehabilitated the pipe, and relaid it. A compelling reason to rehabilitate a pipeline is to get rid of the costs of keeping it in the ground. Miles of permanently idled pipeline are regularly patrolled by employees dedicated to the task. Other companies contract agents at even greater sums to answer "One Calls" or DOT calls flagging lines for construction or other identification purposes. If the company maintains rights-of-way via mowing and general signage upkeep, the costs can be extraordinary. Judicial districts in many states assign ad valorem taxes, school taxes, county taxes, and state taxes to these properties. Theses taxes often go unquestioned and are paid accordingly. Incidental pipeline relocation expenses due to highway and subdivision expansion also seem to be simply passed off as a necessary cost of doing business. Pipeline operators have long abandoned retired equipment in place, seeking to reduce maintenance and care, taxes, and upkeep while maintaining ownership of idled pipelines. Federal and state lawmakers and regulators, however, wish to end this practice and clearly define requirements for abandoning or idling out-of-use pipelines. Idled pipelines pose potential hazards to landowners and land users. New real estate developments in congested areas often face pipeline relocation and identification issues, and landowners might be unaware of rights-of-way. Pipeline companies will be required to remove pipelines if they are termed abandoned or if they are idled with demonstrated "intent to abandon" by lack of maintenance, removal of signage, failure to pay taxes due, etc. Regulators will require companies at least to identify dormant pipeline inventory and obtain permission from landowners before abandonment procedures of any sort. Federal regulation remains pending, but at least one Texas legislator from Houston and another from the Fort Worth (Barnett shale) area will introduce a bill in an upcoming session of the state legislature requiring pipeline operators to notify landowners before abandonment and obtain permission from affected landowners. 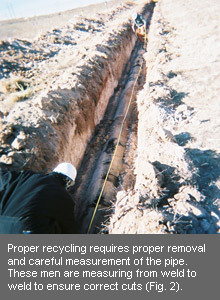 Reusing pipelines relies on good maintenance of the line while in the ground and care during removal. Excavation should be performed by competent and experienced pipeline-recovery personnel. Taking up a pipeline uses many of the same procedures as laying it. A specially equipped track hoe with a custom half-moon shoe attached excavates the pipe (Fig. 1). The shoe generally fits the diameter of the pipe without sharp edges that could damage the exterior of the pipe. A good hoe operator with the right shoe can unearth good pipe, while a poor or inexperienced pipeline excavator can turn the pipe into junk. A side boom can occasionally lift the pipe out of the ditch, but more often the pipe is cut in 100 to 200 ft sections and dragged out of the ditch by a bulldozer. Dragging out too long a length will cause the pipe to bow or bend. After removal, a bulldozer backfills the excavation ditch and dresses the right-of-way. A cutter cuts the pipe at connections in 20, 30, 40, or 60 ft intervals, depending on where the welds lie (Fig. 2). Most truck trailers can carry 40-45 ft pipe sections . Either torch or saw can cut the pipe, depending on preferences of the supervisor and potential fire hazards. A front-end loader can load the pipe on trucks for transport. A track hoe with special forks can also perform this task. Tracks work better on the right-of-way than tires. Two or three pieces of equipment per crew, proper supervision, and competent personnel can remove most pipelines. Most pipelines have some sort of coating. Removing it can occur either on site or at a cleaning yard. Responsible recovery crews have environmental certification and are educated to handle potentially hazardous coating waste. Checking the pipe for bends, bows, dents, and dings follows coating removal, as does confirmation of roundness and straightness. Pipe separation separates the better pipe for shipment to customers or reuse from pipe that might need additional attention. Damages will occur no matter how competent an operator. The track hoe forks or shoe cant dent of ding the pipe during the removal process. Intentionally bowed pipe needs to be straightened (Fig. 3). Customers want round, straight pipe, that is also more economical to load and transport. 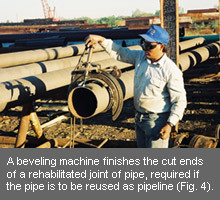 Reusing the pipe as line pipe requires beveling each end where the pipe was cut during removal (Fig. 4). Recovery crews may be able to rehabilitate excavated pipelines at the removal site with portable dedenters, pipe straighteners, and beveling machines. Performing pipe rehabilitation on site reduces the expense of pipe handling to a minimum. If necessary, however, pipe service yards in various parts of the country have the expertise and equipment to handle most jobs. If pipe coating has not been damaged beyond repair, pipe can go directly to a coating facility or threading facility, depending on its intended use. Care and handling of the landowner whose property will be crossed while retrieving the pipe is even more important than care and handling of the pipe itself. A landowner can either help greatly or impede recovery. Most right-of-way contracts grant the pipeline owner rights of removal, repair, ingress, egress, and so forth. But no landowner actually wants you on his or her property, raising the importance of having a skilled, experienced right-of-way agent on the job. The best method when the operator owns the easement is to return the right-of-way to the landowner at the operator's expense. The landowner would like to have clear unencumbered title to his property; granting him that will help move the process along. Once the exchange of dollars comes into the picture, it becomes the basis for everything, and it is only a question of how much the operator is going to pay. Tubular steel has many uses. Hundreds of thousands of tons/year enter the piling markets to shore up anything needing to be strengthened. Anything needing additional support along shorelines, piers for buildings, and bridge supports all use tubular steel derived from rehabilitated pipeline. Millions of tons went to China in the 1980-90s for use in the foundations of its extensive highway network. More than 150 companies resell secondary and rehabilitated line pipe, each specializing in a particular area. One group of companies sells 25,000 ft/month of 16, 18, or 20-in. OD pipe as casing to oil and gas drilling contractors. Another 150,000 ft/month of 8.625 and 10.75-in. OD line enters the surface casing market for oil and gas operators. Companies sell product to piling contractors and for use as culvert for roads and bridges. Still more retired pipe enters farm and ranch operations for use in corrals and cattle guards at gates. Other users need center posts and columns for fences, barns, and other buildings. 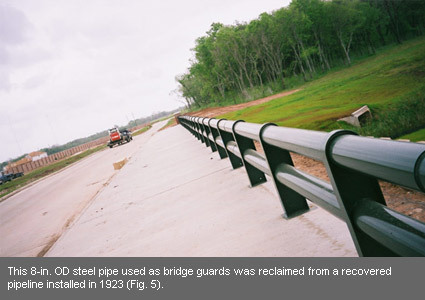 Flag poles, bridge, and guardrail applications consume thousands of tons/year (Fig. 5). But unless scrap prices rise dramatically, this market should be the last resort for pipeline-recovery applications. David Howell is principal of Pipeline Equities, conducting pipeline salvage and recovery as well as brokering and appraising pipelines. Howell is a designated senior right-of-way agent through the International Right of Way Association, holding environmental and acquisition-negotiation certifications. He earned a BA in political science at Texas A&M-Kingsville.